In the United States, the US Weather Bureau (initially part of the Army Signal Corps, and later renamed the National Weather Service) began operations with reports telegraphed from 24 locations, and made its first official meteorological forecast. Johann Palisa discovered asteroid #151 Abundantia at the Austrian Naval Observatory in Pula. M. Wolf discovered asteroid #391 Ingeborg. M. Wolf discovered asteroids #578 Happelia and #1967 Menzel. The first aerial bombardment in history took place when Second Lieutenant Giulio Gavotti of the Italian Army threw three Cipelli hand grenades on Turkish troops at Tagiura in Libya. Gordon Rupert Dickson (1 November 1923 - 31 January 2001) was a Canadian-born science fiction author who spent most of his life in Minneapolis, Minnesota. He is probably most famous for his Childe Cycle books, and won three Hugo awards. Wernher von Braun signed a contract with the Reichswehr (Germany's Imperial Defense organization) to conduct research leading to the development of rockets as military weapons, which resulted in the German liquid-fuel rocket program. 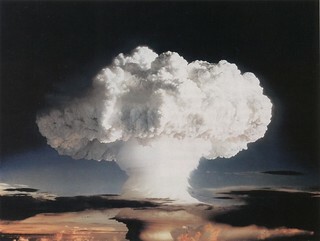 The United States successfully detonated the first hydrogen bomb, codenamed "Ivy Mike" [Operation Ivy, "m" for megaton], on Elugelab Island in the Enewetak Atoll in the Pacific Ocean. 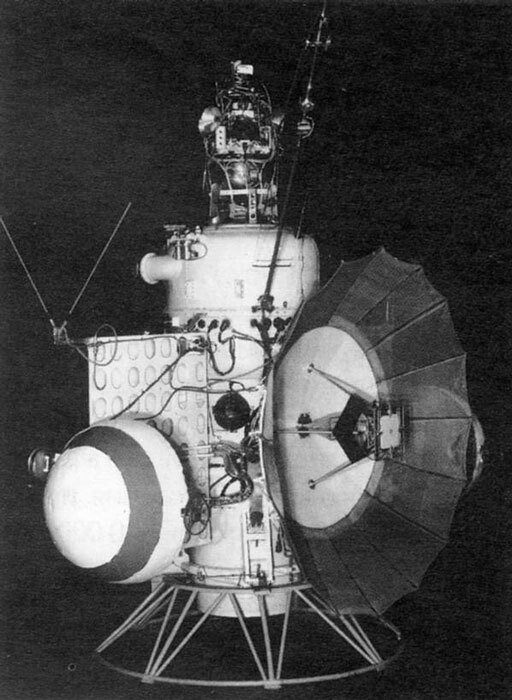 USSR launched Mars 1 toward Mars from Baikonur, the first spacecraft to fly by another planet. Mars 1 (1962 Beta Nu 1, Mars 2MV-4) was an automatic interplanetary station launched into a 157 x 238 km, 65 degree Earth parking orbit on Sputnik 23, from which it was sent in the direction of Mars, with the intent of flying by the planet at a distance of about 11,000 km. Its announced mission was prolonged exploration of outer space during flight to the planet Mars, establishment of inter-planetary radio communications, photgraphing of the planet Mars and subsquent radio-transmission to Earth of the photographs of the surface of Mars thus obtained. It was designed to image the surface and send back data on cosmic radiation, micrometeoroid impacts and Mars' magnetic field, radiation environment, atmospheric structure, and possible organic compounds. After leaving Earth orbit, the spacecraft and the booster fourth stage separated and the solar panels were deployed. Early telemetry indicated that there was a leak in one of the gas valves in the orientation system so the spacecraft was transferred to gyroscopic stabilization. Sixty-one radio transmissions were made, initially at two day intervals, later at five day intervals, in which a large amount of interplanetary data were collected. On 21 March 1963, when the spacecraft was at a distance of 106,760,000 km from Earth on its way to Mars, communications ceased, probably due to failure of the spacecraft orientation system. Mars 1 closest approach to Mars occurred on 19 June 1963 at a distance of approximately 193,000 km, after which the spacecraft entered a heliocentric orbit. The probe recorded one micrometeorite strike every two minutes at altitudes ranging from 6000 to 40,000 km due to the Taurids meteor shower, and recorded similar densities at distances from 20 to 40 million km. Magnetic field intensities of 3-4 gammas with peaks as high as 6-9 gammas were measured in interplanetary space and the solar wind was detected. Measurements of cosmic rays showed that their intensity had almost doubled since 1959. The radiation zones around the Earth were detected and their magnitude confirmed. Mars 1 was a modified Venera-type spacecraft in the shape of a cylinder 3.3 meters long and 1.0 meter in diameter. The spacecraft measured 4 meters across with the solar panels and radiators deployed. The cylinder was divided into two compartments. The upper 2.7 meters, the orbital module, contained guidance and on-board propulsion systems. The experiment module, containing the scientific instrumentation, comprised the bottom 0.6 meters of the cylinder. A 1.7 meter parabolic high gain antenna was used for communication, along with an omnidirectional antenna and a semi-directional antenna. Power was supplied by two solar panel wings with a total area of 2.6 square meters affixed to opposite sides of the spacecraft. Power was stored in a 42 amp-hour cadmium-nickel battery. Communications were via a decimeter wavelength radio transmitter mounted in the orbital module which used the high-gain antenna. This was supplemented by a meter wavelength range transmitter through the omnidirectional antenna. An 8 centimeter wavelength transmitter mounted in the experiment module was designed to transmit the TV images. Also mounted in the experiment module was a 5-centimeter range impulse transmitter. Temperature control was achieved using a binary gas-liquid system and hemispherical radiators mounted on the ends of the solar panels. The craft carried various scientific instruments including a magnetometer probe, television photographic equipment, a spectroreflexometer, radiation sensors (gas-discharge and scintillation counters), a spectrograph to study ozone absorption bands, and a micrometeoroid instrument. Mars 1 was originally called Sputnik 30 in the US Naval Space Command Satellite Situation Summary. The Arecibo Observatory officially opened in Arecibo, Puerto Rico, the largest single-dish radio telescope ever constructed until July 2016 when the Five hundred meter Aperture Spherical Telescope in China was completed. NASA and the USAF launched X-15A MuMet/DCR/SB Meteorological/Aeronomy mission # 174 for which William Dana received astronaut wings (USAF definition) when he reached an altitude of 93.543 km with a maximum speed of 6035 kph (Mach 5.46). Chiron, one of the farthest known asteroids and one of two minor planets with rings, was discovered by Charles Kowal from images taken on 18 October. K. Tomita discovered asteroids #2252 CERGA and #3056 INAG. Purple Mountain Observatory discovered asteroid #3729. NASA's STS 52 (Columbia 13) landed after 10 days in space on a mission to deploy the Laser Geodynamic Satellite II (LAGEOS-II), operate the US Microgravity Payload-1 (USMP-1), and conduct other secondary experiments. STS 52 began when Columbia and her crew of six lifted off from Pad 39B at 1:09 PM EDT 22 October 1992, on a ten-day mission. The primary mission objectives were the deployment of the Laser Geodynamic Satellite II (LAGEOS-II) and operation of the U.S. Microgravity Payload-1 (USMP-1). LAGEOS-II, a joint effort between NASA and the Italian Space Agency (ASI), was deployed on day two and boosted into an initial elliptical orbit by ASI's Italian Research Interim Stage (IRIS). The spacecraft's apogee kick motor later circularized LAGEOS orbit at its operational altitude of 3,666 miles. The USMP-1, which was activated on day one, included three experiments mounted on two connected Mission Peculiar Equipment Support Structures (MPESS) mounted in the orbiter's cargo bay. USMP-1 experiments were: Lambda Point Experiment; Materiel Pour L'Etude Des Phenomenes Interessant La Solidification Sur Et En Orbite (MEPHISTO), sponsored by the French agency Centre National d'Etudes Spatiales; and Space Acceleration Measurement System (SAMS). Secondary payloads: Canadian experiment, CANEX-2, located in both the orbiter's cargo bay and middeck consisted of Space Vision System (SVS), Materials Exposure in Low-Earth Orbit (MELEO), Queen's University Experiment in Liquid-Metal Diffusion (QUELD), Phase Partitioning in Liquids (PARLIQ), Sun Photospectrometer Earth Atmosphere Measurement-2 (SPEAM-2), Orbiter Glow-2 (OGLOW-2), and Space Adaptation Tests and Observations (SATO); a small, specially marked satellite, the Canadian Target Assembly, was deployed on day nine, to support SVS experiments; ASP, with three independent sensors mounted on a Hitchhiker plate in the cargo bay: Modular Star Sensor, Yaw Earth Sensor and Low Altitude Conical Earth Sensor, all provided by the European Space Agency. Other middeck payloads: Commercial Materials Dispersion Apparatus Instrument Technology Associates Experiments; Commercial Protein Crystal Growth experiment; Chemical Vapor Transport Experiment; Heat Pipe Performance Experiment; Physiological Systems Experiment (involving 12 rodents); and Shuttle Plume Impingement Experiment. The orbiter also was used as a reference point for calibrating an Ultraviolet Plume Instrument on an orbiting Strategic Defense Initiative Organization satellite. The Tank Pressure Control Experiment/Thermal Phenomena (TPCE/TP) was contained in a Getaway Special (GAS) canister in the orbiter's cargo bay. STS 52 ended on 1 November 1992 when Columbia landed on revolution 159 on Runway 33, Kennedy Space Center Shuttle Landing Facility. Rollout distance: 10,708 feet. Rollout time: 63 seconds. Launch weight: 250,130 pounds. Landing weight: 215,114 pounds. Orbit altitude: 163 nautical miles. Orbit inclination: 28.45 degrees. Mission duration: 9 days, 20 hours, 56 minutes and 13 seconds. Miles traveled: 4.1 million. The flight crew for STS 52 was: James D. Wetherbee, Commander; Michael A. Baker, Pilot; Charles L. Veach, Mission Specialist; William M. Shepherd, Mission Specialist; Tamara E. Jernigan, Mission Specialist; Steven A. MacLean, Payload Specialist. NASA's STS 58 (Columbia 15, Shuttle 58) ended after carrying the Spacelab Life Sciences-2 (SLS-2) experiment platform to space. The first launch attempt of STS 58 on 14 October 1993 was scrubbed at the T-31 second mark due to a failed Range Safety computer. The second launch attempt on 15 October was scrubbed at the T-9 minute mark due to a failed S-band transponder on the orbiter. The launch was reset for 18 October 1993, when the countdown proceeded smoothly to liftoff, delayed only by several seconds because of an aircraft in the launch zone. STS 58 was the second dedicated Spacelab Life Sciences mission (SLS-2). Fourteen experiments were conducted in four areas: regulatory physiology, cardiovascular/cardiopulmonary, musculoskeletal and neuroscience. Eight of the experiments focused on the crew; six on 48 rodents. The crew collected more than 650 different samples from themselves and the rodents, increasing the statistical base for life sciences research. The combined data from SLS-1 and SLS-2 will help build a comprehensive picture of how humans and animals adapt to weightlessness. The cardiovascular investigations were: Inflight Study of Cardiovascular Deconditioning; Cardiovascular Adaptation to Zero Gravity; Pulmonary Function during Weightlessness. The regulatory physiology investigations were: Fluid Electrolyte Regulation during Space flight; Regulation of Blood Volume during Space flight; Regulation of Erythropoiesis in Rats during Space flight; Influence of Space flight on Erythrokinetics in Man. The musculoskeletal investigations were: Protein Metabolism during Space flight; Effects of Zero Gravity on the Functional and Biochemical Properties of Antigravity Skeletal Muscle; Effects of Microgravity on the Electron Microscopy, Histochemistry and Protease Activities of Rat Hindlimb Muscles; Pathophysiology of Mineral Loss during Space flight; Bone, Calcium and Spaceflight. The neuroscience investigations were: Study of the Effects of Space Travel on Mammalian Gravity Receptors; Vestibular Experiments in Spacelab. For one of the neurovestibular experiments, the Rotating Dome Experiment, the crew worked with the first flight prototype of the Astronaut Science Advisor (ASA), a laptop computer designed to assist astronauts conducting experiments, also called the "principal investigator in a box" because it can increase the efficiency of experiment activities. Six rodents were put to death and dissected during the mission, yielding the first tissue samples collected in space and not altered by re-exposure to Earth's gravity. Other experiments flown on STS 58 were: Orbital Acceleration Research Experiment (OARE); Shuttle Amateur Radio Experiment (SAREX); Pilot Inflight Landing Operations Trainer (PILOT), a portable laptop computer simulator to allow the pilot and commander to maintain proficiency for approach and landing during longer missions. With completion of her fourth space flight, Lucid accumulated the most flight time for a female astronaut on the Shuttle, 838 hours. STS 58 ended 1 November 1993 at the close of the longest Shuttle mission to date when Columbia landed on revolution 225 on Runway 22, Edwards Air Force Base, California. Rollout distance: 9,640 feet (2,938 meters). Rollout time: one minute, one second. Landing weight: 229,753 pounds. Orbit altitude: 155 nautical miles. Orbit inclination: 39 degrees. Mission duration: 14 days, 12 minutes, 32 seconds. Miles Traveled: 5.8 million. Columbia was returned to the Kennedy Space Center on 9 November 1993. The flight crew for STS 58 was: John E. Blaha, Commander; Richard A. Searfoss, Pilot; M. Rhea Seddon, Mission Specialist 1; William S. McArthur Jr., Mission Specialist 2; David A. Wolf, Mission Specialist 3; Shannon W. Lucid, Mission Specialist 4; Martin Fettman, Payload Specialist 1. The Spartan 201 satellite was deployed from STS 95 (Discovery 25) on its fifth mission to observe the solar corona. The mission data was used to recalibrate the SOHO satellite which had recently resumed observation of the Sun following loss of control.